CONCORD, N.C. – Nov. 1, 2012 – The World of Outlaws Sprint Car, Late Model and Super DIRTcar Series’ seasons have all come down to this. 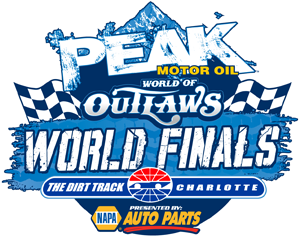 All dirt roads lead to Charlotte, and tonight, the PEAK Motor Oil World of Outlaws World Finals presented by NAPA Auto Parts kicks off at The Dirt Track at Charlotte.DIRTVision.com brings you free, live audio all weekend long. Plus, for just $19.99, you can watch it all unfold tonight and tomorrow night exclusively at DIRTVision.com. You can see qualifying, heat races and feature events in two jam-packed nights as all three series work their way to Saturday night’s season finale. Then, after DIRTVision.com provides you with live video coverage of the first two nights, you can see all the action from Saturday night live on SPEED starting at 8:00 p.m. EST. This is it for all the series, and the frontrunners are giving it all they’ve got for a chance to battle for point positions. If you can’t make it to the biggest weekend in dirt track racing, you can follow the entire weekend at DIRTVision.com. You won’t want to miss a second of the action as all three series crown a champion this weekend. Fans can follow DIRTVision on Twitter by clicking http://twitter.com/dirtvision. Also, be sure to follow @World_Finals for all your championship news! For technical questions about DIRTVision, please e-mail DIRTVision@dirtcar.com. DIRTVision.com is brought to fans around the world by several important sponsors and partners, including ButlerBuilt Professional Seat Systems and Winged Nation.